Synthetic peptide corresponding to 6X His tag®. WB: His-tagged mouse Cathepsin D and CDKN2A/p16INK4a proteins; HEK-293T transfected with His-tagged Staphylococcus aureus cas9, human Brachyury, human PRDM9 and human GAPDH cell lysates. IHC-P: HEK-293T cells transfected with His-tagged S.aureus cas9. ICC/IF: HEK-293T cells transfected with GFP-Myc-His. Flow Cyt: HEK-293T cells transfected with GFP-Myc-His. IP: HEK-293T cells transfected with His-tagged S.aureus cas9 cell lysate. ChIP: Chromatin from MCF7 cells transfected with 6X His-tagged GATA3. Our Abpromise guarantee covers the use of ab213204 in the following tested applications. IHC-P 1/16000. Perform heat mediated antigen retrieval with Tris/EDTA buffer pH 9.0 before commencing with IHC staining protocol. We don’t recommend this antibody for mouse in IHC. In our hands mouse tissues showed non-specific staining. The H-H-H-H-H-H motif is used as a tag on many recombinant proteins to facilitate purification. The antibody recognizes the His-tag fused to the amino- or carboxy- termini of targeted proteins in transfected or transformed cells. Depends upon the localization of the parent protein tagged with hexahistidine. His-tagged Staphylococcus aureus cas9 was immunoprecipitated from 0.35 mg of HEK-293T (human epithelial cell line from embryonic kidney transformed with large T antigen) transfected with a His-tagged Staphylococcus aureus cas9 (J7RUA5; aa1-1053; 125 kDa) construct, whole cell lysate with ab213204 at 1/30 dilution. Western blot was performed from the immunoprecipitate using ab213204 at 1/1000 dilution. 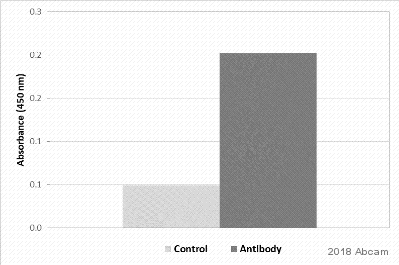 VeriBlot for IP secondary antibody (HRP) (ab131366), was used as secondary antibody at 1/10000 dilution. Lane 1: HEK-293T transfected with His-tagged Staphylococcus aureus cas9 construct, whole cell lysate 10 μg (Input). Lane 2: ab213204 IP in HEK-293T transfected with His-tagged Staphylococcus aureus cas9 construct, whole cell lysate. Lane 3: Rabbit monoclonal IgG (ab172730) instead of ab213204 in HEK-293T transfected with His-tagged Staphylococcus aureus cas9 construct, whole cell lysate. Immunofluorescent analysis of 4% paraformaldehyde-fixed, 0.1% Triton X-100 permeabilized HEK-293T (human epithelial cell line from embryonic kidney transformed with large T antigen) cells transfected with GFP-Myc-His vector expression construct labeling 6X His tag® with ab213204 at 1/100 dilution, followed by Goat Anti-Rabbit IgG H&L (Alexa Fluor® 488) (ab150077) secondary antibody at 1/1000 dilution (white). Confocal image showing positive staining on HEK-293T cells transfected with GFP-Myc-His vector expression construct. The nuclear counter stain is DAPI (blue). Tubulin is detected with Anti-alpha Tubulin antibody [DM1A] - Microtubule Marker (Alexa Fluor® 594) (ab195889) (red) at 1/200 dilution. Immunohistochemical analysis of agarose-embedded HEK-293T (human epithelial cell line from embryonic kidney transformed with large T antigen) transfected with a His-tagged Staphylococcus aureus cas9 (J7RUA5; aa1-1053; 125kDa) construct labeling 6X His tag® with ab213204 at 1/16000 dilution, followed by Goat Anti-Rabbit IgG H&L (HRP) Ready to use. Left image: Positive staining on HEK-293T transfected with a His-tagged Staphylococcus aureus cas9 (J7RUA5; aa1-1053; 125kDa) construct. Right image: No staining on HEK-293T transfected with an empty expression vector. Immunohistochemical analysis of paraffin-embedded human liver tissue labeling 6X His tag® with ab213204 at 1/16000 dilution, followed by Goat Anti-Rabbit IgG H&L (HRP) Ready to use. Negative control: No staining on human liver. Immunohistochemical analysis of paraffin-embedded rat stomach tissue labeling 6X His tag® with ab213204 at 1/16000 dilution, followed by Goat Anti-Rabbit IgG H&L (HRP) Ready to use. Negative control: No staining on rat stomach. Chromatin was prepared from MCF7 (human breast adenocarcinoma cell line) cells transfected with 6X His-tagged GATA3 according to the Abcam X-ChIP protocol. Cells were fixed with formaldehyde for 10 minutes. The ChIP was performed with 25µg of chromatin, 2µg of ab213204 (blue), and 20µl of A/G sepharose beads slurry (10µl of sepharose A beads + 10µl of sepharose G beads). 2μg of rabbit normal IgG was added to the beads control (yellow). The immunoprecipitated DNA was quantified by real time PCR (Sybr green approach). ChIP was performed according to the literature (PMID:22951069). Flow cytometric analysis of 4% paraformaldehyde-fixed, 90% methanol permeabilized HEK-293T (human epithelial cell line from embryonic kidney transformed with large T antigen) transfected with GFP-Myc-His vector labeling 6X His tag® with ab213204 (right panel) at 1/5000 dilution compared with a Rabbit IgG, monoclonal [EPR25A] - Isotype Control (ab172730) (left panel). Goat Anti-Rabbit IgG H&L (Alexa Fluor® 647) (ab150079) at 1/2000 dilution was used as the secondary antibody. Gate is set between transfected and untransfected HEK-293T cells. Observed band size: 18,27 kDa why is the actual band size different from the predicted? Observed band size: 100,125,36,50 kDa why is the actual band size different from the predicted? Exposure time: Lane 1-3: 1 second; Lane 4-5: 10 seconds. Publishing research using ab213204? Please let us know so that we can cite the reference in this datasheet.